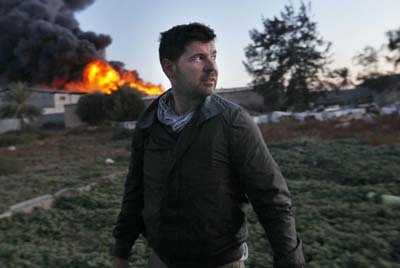 It’s hard to believe it’s been a year since our friend and steadfast CIVIC supporter Chris Hondros was killed while on assignment in Misrata, Libya. Chris was a Pulitzer Prize nominated photojournalist who covered most of the worlds major conflicts beginning in the late 90s. Chris covered conflicts, but his real passion was capturing the people affected by them. Chris’ images of civilians struggling to survive amidst bullets and bombs gave us all an immediate understanding of the gravity of war. You’ve likely seen his images on the front page of flagship newspapers such as the New York Times, Washington Post and numerous others. But what you may not have known was that Chris’ work has been the visual representation of what we do here at CIVIC since 2005. He gave us his images so we could tell the story of war victims and why our work matters. Below are a few of his incredible images. Nea rly six years ago I began my career here at CIVIC as an advocate for war victims and their loved ones. Six months ago today in Misrata, Libya while documenting the plight of Libyans in the war, my dear friend Chris Hondros became a war victim himself. Chris spent his life photographing the human cost of conflict. He’d been to every major conflict in the past decade and a half (Kosovo, Liberia, Afghanistan, Iraq and several others). And now, he’s gone, just like so many he had photographed before. What a strange and cruel irony. For years I’d seen the stories of those harmed in war in Chris’ photos, read their stories in numerous books and reports, and even sat in living rooms and listened to them recounted first hand. I had watched as mothers told about losing their children or wives of their husbands, as tears rolled down their cheeks and tissues whisked across their faces. I had cried sometimes myself for these people, to see and actually feel how real and raw their emotions were. But I was completely ill prepared for what it was like when it hit home. I equate it to a personal earthquake. Not the tremor kind, but the building crushing kind. The rollercoaster of emotion was intense. There was anger, first at whomever killed him … and then eventually at him for putting himself into such a risky situation. There was profound sadness, for my own loss and for the loss being endured by his family and friends. At his memorial service there was laughter and tears, but mostly a paralyzing numbness. I felt like my ability to understand even the most simple of things had been taken away. Nothing made sense, not even my work which had always been very important to me and a place where I felt safe and focused. As these emotions stabilized a bit, their space has been filled by an even stronger conviction and passion for CIVIC’s work. I understand intensely – and now personally – the need for every loss of human life in conflict to be recognized. I understand that everyone deserves to know what happened to their loved one and more clearly why it happened. I want someone to tell me, and to tell Chris’s fiancée and his mother and his best friends why this happened and that they are sorry and that it wasn’t their intention (assuming in fact it wasn’t). We’ll likely never get that. But it’s why we do the work we do at CIVIC, because everyone who has lost in war deserves dignity.